Salisbury Civic Society is a registered charity and a voluntary organisation whose prime interest is the well-being of the buildings of South Wiltshire. 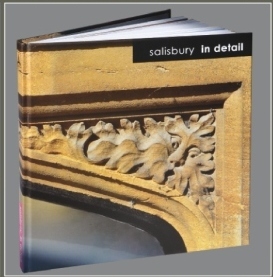 This book’s starting point was a donation to the Society in memory of a member’s parents, it contains over 500 colour photos of parts of Salisbury’s secular buildings and the spaces between them, assembled to present a portrait of the whole city. The photography was carried out by half a dozen members, who soon learned not to make any assumptions about where such features might be located, if you look closely, there are fascinating details to be found in the most surprising places. The photos cover the whole city, not just the historic core. S ome of these photos will be instantly recognisable, but many may be a complete revelation. It is hoped that Salisbury in Detail will encourage people to look with fresh eyes on familiar street scenes, and appreciate aspects of the city which they might never previously have been aware of. Although a number of members were responsible for producing the book Richard Deane was the driving force and wrote the text. The success of the book has been extraordinary with 3000 copies published. An excellent review of the book was published in Cornerstone, the magazine of SPAB (The Society for the Protection of Ancient Buildings) which has a membership of over 9,000. 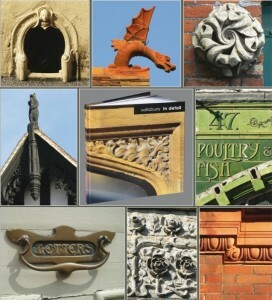 We are delighted that our book has led to the publication of similar books on Peterborough and Eastbourne. A survey by the Society of the centre of the city of Salisbury. In 2005 the Society researched and published a report on the state of Salisbury City Centre. Like so many towns and cities, the streetscape has become littered with a proliferation of traffic, parking signs, bins, bollards, guard rails, anonymous black boxes and road markings that have over time markedly reduced its character. Our Family Quiz is suitable for all ages and is based on architectural details in the Cathedral Close featured in our book ‘Salisbury in Detail’ (not necessary for the answers). The Quiz entails a 40-minute walk to view buildings around Choristers Green and in West Walk and North Walk, mostly visible from the safe, grassy areas. As well as simple ‘Can you spot …?‘ questions, there are others linking the architecture with historical aspects and suggesting background information which could be looked up later.